If you've watched your neighbor "watering her sidewalk" or wrung your hands at the sight of agricultural runoff, now is your chance to allocate the state's water resources. 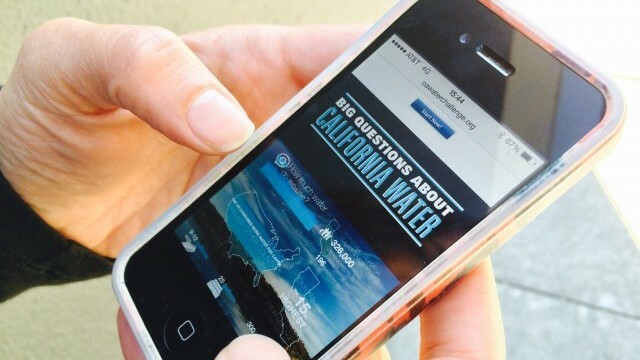 A new online game lets California residents control the state's water -- virtually, at least. 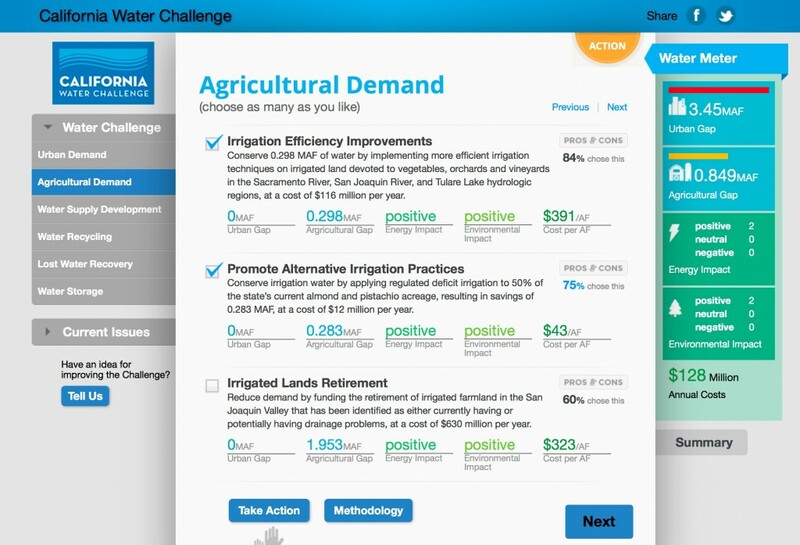 From desalination investment to mandatory water reductions, the California Water Challenge lets users choose a range of outcomes and see how others voted. Price tags are attached to decisions, which have varying effects on energy consumption and the environment. Choosing to build a new reservoir, for example, not only costs $236 million per year, but it can also harm local ecosystems and may result in the loss of property tax revenue to local governments. During the worst drought in the state's recorded history, Next 10, the non-profit that created the game, believes making difficult decisions will help people understand the extent of the drought. Next 10 is backed by venture capitalist F. Noel Perry, who also serves on the leadership council for the Public Policy Institute of California. The game follows the lead of "you-fix-it" games like the New York Times' popular Budget Puzzle, which asked citizens to balance the federal budget in 2010. These games often expose gaps in knowledge or reveal underlying assumptions about government spending. For a generation of millennials, they also speak a familiar language. "Games are fast becoming the defining metaphor of our time," Peter T. Coleman, professor of psychology and education at Columbia University told Psychology Today. "How we think about, see and engage our world is largely determined by the metaphors we use to make sense of it." For Californians, this game may be a way to talk about a potentially eye-glazing issue with no easy solution. The game's developers hope that being at the reins, even for five minutes, might usher in a sense of urgency and understanding about a new reality setting in for California.